Kitchen cabinets are an important component of any kitchen. In any kitchen renovating budget, cabinetry is the biggest expense. Cabinets perform the function of storage, helping you stay organized. In addition to this, they add character and personality to the kitchen. There are many options available with kitchen cabinetry and these can be broadly categorized into base, wall and special use. It will cost you less to go for the standard sizes and you will get similar dimensions with different brands to help you compare. 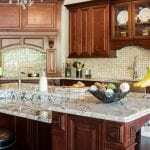 While taking size into account, however, it is necessary to ensure that your cabinets match the other standard fixtures and kitchen appliances. There are different kinds of kitchen wall cabinets and the ones you choose will depend on how you plan to use them. Recessed wall cabinets are big space savers and make for good storage. You may have a size limitation with these since it depends on the wall. Curio wall cabinets are elegant, stylish and decorative. You can store stuff in them while adding to your kitchen’s good looks. Another space saver is the corner wall cabinets, letting you make the best use of space available, especially in smaller kitchens. You will mostly come across wood or metal wall cabinets. Wood has a warm and cosy look and is the more traditional choice. On the other hand, metal wall cabinets can be easier to maintain and more durable. If you want your wall cabinets to be multi-purpose, you can go for the mirrored type. It can give the illusion of a larger space and highlight certain design elements in the kitchen, depending on where it is located. Wall cabinets are usually fixed to the wall with studs. They can also be hung from ceiling joists if you have a peninsula or an island in the kitchen. These units can be single units or double units and come with a variety of features. Most wall cabinets are about a foot deep and with a width range of nine to 48 inches. Their height can range from 14, 18 and 30 inches. Short wall cabinets usually go over the refrigerators, cooking ranges and sinks. The tall ones can also be as high as the ceiling. In most instances, installing wall cabinets is easy for those who can use basic tools and enjoy do it yourself projects. However, most manufacturers and dealers offer the option of installation, so it might be advisable to go for professional installation. Cabinet contractors help with designing, making and installing your kitchen wall cabinets. Even if it means a little extra expense, it is worth it. Kitchen cabinet knobs have a practical purpose. Yet, they can play an important role in giving your kitchen a totally new look with the kind of choice you have. Your selection is literally limited by your creativity in putting together the cabinet knobs that will do their job, as well as turn out to be conversation pieces. The best thing about kitchen cabinet knobs is that they are a very cost-effective way to transform the way your kitchen looks, without going in for expensive renovations. For a subtly elegant look, ceramic knobs and glass cabinet knobs are ideal. They give you a good grasp and are easy to pull. If your kitchen is done up in a theme, you can choose the shape of your knobs accordingly. Novelty knobs are quite popular and can enhance your kitchen’s customized look. Brass knobs are suitable for a classy and decorative look. Antique brass knobs are quite popular and fit in with practically any kind of cabinetry. These are very durable and never go out of fashion. Whether plain or shaped into different designs, brass knobs are a good choice for cabinet knobs. Bronze is another material that is great for kitchen knobs. Glass knobs can also look at home with a variety of cabinetry finishes and appear quite dressy when you go in for the coloured variety. Both glass and bronze have a polished look that needs little maintenance. The ceramic cabinet knobs look elegant and these come in a large array of designs and colours. Some people prefer handles to knobs. How do you decide on whether you want knobs or handles? Look at the décor of your kitchen. One way to choose your kitchen cabinet knobs or handles is by matching it to the door hardware. If your doors have knobs, then go in for cabinet knobs. If the doors have handles, choose cabinet handles. There is no hard or fast rule here. Some kitchens have a mix of both and manage to create a complementary look by using knobs for the cabinetry and pulls or handles for the drawers. The important thing is to ensure that there is a harmonious look. Kitchen cabinet knobs are considered more stylish than handles because of the unique shape, size, materials and designs that are available. They are easier to use and there is more choice when you want to match them to your specific décor. There is so much choice available in decorative kitchen cabinet hardware that it is easy to express yourself through your taste.